In Revue of Dreams: The vocals were cut in scene 18, and the music was replaced in scene 19. 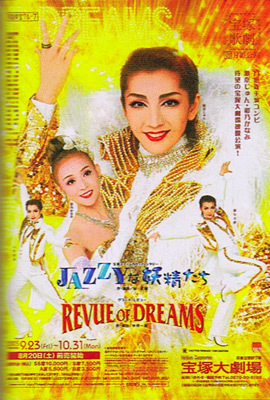 Shimizu Kyouka was absent from the Takarazuka run because of an injury, and Moeka Yuria played the role of Annie. When she returned for the Tokyo run, Shimizu Kyouka played Jean. Kusakaze Nana was absent from the entire run. In 1920, in the United States of America, a publication party is being held in a luxury hotel in New York for Shannon McNeil who has made her debut as a fairy tale author. Congressional candidate Patrick Gael comes to the hotel to celebrate the start of his election campaign. An immigrant from Ireland, he has the support of influential political and business personalities including President Wilson, an Irish-American. He is said to be sure of election. Patrick approaches Shannon who is standing alone in the hotel courtyard. While young, both of them were in a foster home in a small village in Ireland. In the courtyard, they talk about their childhood memories. The village people where they were brought up had a legend. In this legend, there was a fairy island called Suaimhneas somewhere in the Atlantic far away from Ireland, and all the villagers believed in fairies. For a while after being put into the orphanage at a very young age, Shannon would sob all the time, and it was Patrick who comforted her by telling her tales about fairies everyday. Shannon has now compiled such tales into a book. Shannon and Patrick still believe in fairies and are quite sure that fairies are also in New York. As soon as they take out the King of the Fairies' gem which they had found in the wood of the fairies in their childhood, they hear a voice coming from nowhere. The voice declares he is King Oberon of the Fairies. Seven fairies shortly appear. They have come all the way to America in search of the gem. All of a sudden, a gun goes off. The fairies immediately disappear. Someone has shot dead one of Patrick's supporters, the New York City Police Commissioner. While the hotel guests flee in panic, Walter Coughlin approaches Patrick and Shannon. Walter was raised together with Patrick and Shannon in the same orphanage. He lets out a defiant smile and goes away leaving them behind. Shortly afterward, policeman Mick O'Brien stands before Walter who was hit and wounded by somebody. Mick was also a friend of Walter's at the orphanage. Walter becomes tense. Mick then tells him that he has come to help him. Timothy Callahan who was also brought up in the same orphanage learns about the commissioner's assassination. He is now a gossip writer who often extorts money from people in exchange for not writing about them. He decides to nose out any information with which he may use to get some money. On the next day, Shannon visits Patrick's campaign office with Rosie. Dan McGovern, an important supporter of Patrick, enters the office soon afterward. Displeased with the office Patrick opened in a warehouse at the port, he asks Patrick in an arrogant tone to move it to somewhere more appropriate. Many immigrants set foot in America at the port wherefrom they set off far and wide across the land. Patrick considers the port to be the starting point for immigrants. He wants to start his campaign from that same point. Patrick sticks to his choice of location of the office while McGovern insists that it should be moved to somewhere else. At the port overlooking the Hudson, Patrick talks to Shannon of the days just after they arrived in America. Patrick, Shannon, Timothy, Walter and Mick, all five of them who were raised in the same orphanage, came over aboard the same immigrant ship and each started a new life. Patrick's dream is to become president in America where it is not entirely impossible for an Irish orphan to realize his dream. Shannon in love with Patrick since her childhood hopes his dream will come true. Soon after she wishes him success in becoming president, she abruptly falls unconscious. Patrick carries Shannon back into her room, where she regains consciousness. He embraces her and tells her to lie quietly. Although he wants to stay with her, his office awaiting him calls with a message that he should return. He leaves her room saying that he will be back soon. Shannon realizes that he has not been honest about her health. She had not fallen unconscious from overwork. She calls out to the fairies and asks them to tell her the true name of her disease. As fairies are incapable of lying, they confess that she has leukemia. She has at maximum 12 months to live. After the shock is gone, she is determined to live her remaining life for Patrick. After parting from McGovern, Patrick continues his campaign with his campaigners in spite of obstructions from McGovern's followers. He learns that Shannon cannot be found anywhere. As Patrick has no family, Shannon is like a sister or a part of himself. He rushes out of the office in search of her although he is at the height of his election campaign. Patrick finds Shannon in Central Park. He suggests that she should register her existence in his memory, declaring that he loves her. Walter then turns up. He has been hired by McGovern to kill Patrick. Timothy and Mick then arrive to stop Walter from shooting Patrick. Now, the five orphans brought up in the same orphanage meet again in Central Park. Man of Prologue S sings the opening of the revue in front of a setting where letters on a board read REVUE OF DREAMS. In front of an image of the city of New York, Urban Young Man A and several dancers sing their wishes of dancing one day on grand stages. Before a setting inspiring the streets of New York, gorgeous dance numbers roll out on such a stage as Urban Young Man A and the dancers dream of. Feeling loved by somebody, young man Forever goes on walking forward expecting a bright future. All the members of the Moon Troupe perform fabulous dance numbers dreaming of a bright future within a setting reminiscent of a vast universe. Sand Woman dances imitating sand whirling in the wind in a boundless expanse of the desert. The travelers go on in the desert. Sand storms obstruct the travelers from time to time. They continue traveling forward fighting the forces of nature. In the course of the trip, they make a companion of nature and continue walking. Takarazuka's Rocket Boys and Rocket Girls perform a routine of precision dances. Gentlewomen perform a series of dance numbers. Players of male roles dance in front of the grand staircase. Players of male roles and those of female roles dance together. A gentleman and a gentlewoman dance a duet. Every performer marches in parade. Kouki Subaru and Tsukifune Sarara's final show. Created by jenebi. Last Modification: Wednesday 11 of June, 2014 05:27:07 PDT by kyanited.